Whether working long hours in the office or doing most of your work from home, sitting down for many hours during the day can be detrimental to a persons health. Small periods of sitting are nothing to worry about, but research from the Mayo Clinic has shown that sitting for lengthy periods of time can negatively affect a persons health in a myriad of different ways. Such illnesses as obesity, diabetes, cancer and cardiovascular disease can all result due to living a sedentary lifestyle. Dangerous and potentially deadly blood clots can even develop due to large amounts of sitting. Sitting many hours per day isn’t something that can be counteracted by a strenuous exercise routine at the gym after work, as sitting needs to be broken up in order to stave off any negative health consequences. The best way to continue working in an efficient manner is by utilizing what is known as a standing desk. While there are a plethora of different brands and models of standing desks available, the following will provide a review for the VARIDESK Pro Plus 48 and will take a look at the pros and cons of this standing desk. For those that aren’t fully aware, a standing desk is a desk that takes the standard sitting work desk and converts it into one that allows users to work comfortably and efficiently while in the standing position. There is no loss in work efficiency when completing your work from a standing desk, which means that you retain all the good aspects of a sitting desk, while having the added benefit of no longer having to worry about negative consequences to your health by sitting for hours on end during the day. Simply lift the desk from a sitting to standing position when you feel as though it’s time to stand and work for a bit. Now it’s time to move onto the actual product. 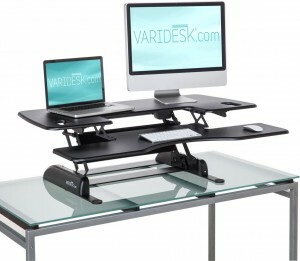 VARIDESK has a long line of standing desks available for customers to choose from. The Pro 48 is advertised as one of the premier standing desks on the market due to its nearly 4 ft. of work surface. The desk itself can hold up to 45 pounds, which is more than enough to fit computers, modems, beverages and other devices on the surface without it overburdening the desk. The keyboard deck lifts along with the desk, while the entire setup can be switched from a sitting position to a standing one in a mere 3 seconds. The desk can be adjusted to practically any height, which means that it can be used by nearly everyone. It’s also designed in a way in which it will fit on most desks in offices or even cubicles. The work space on the standing desk is rather large at just around 4 ft., while the mouse space in particular is large enough for comfortable movement no matter the task you’re trying to accomplish. The fact that while the desk supports dual monitors is largely fantastic. However, the large amount of space on the Pro 48 means that the standing desk as a whole requires much more workspace than normal, which means there are going to be times when standard cubicle spaces won’t be large enough to support the device. 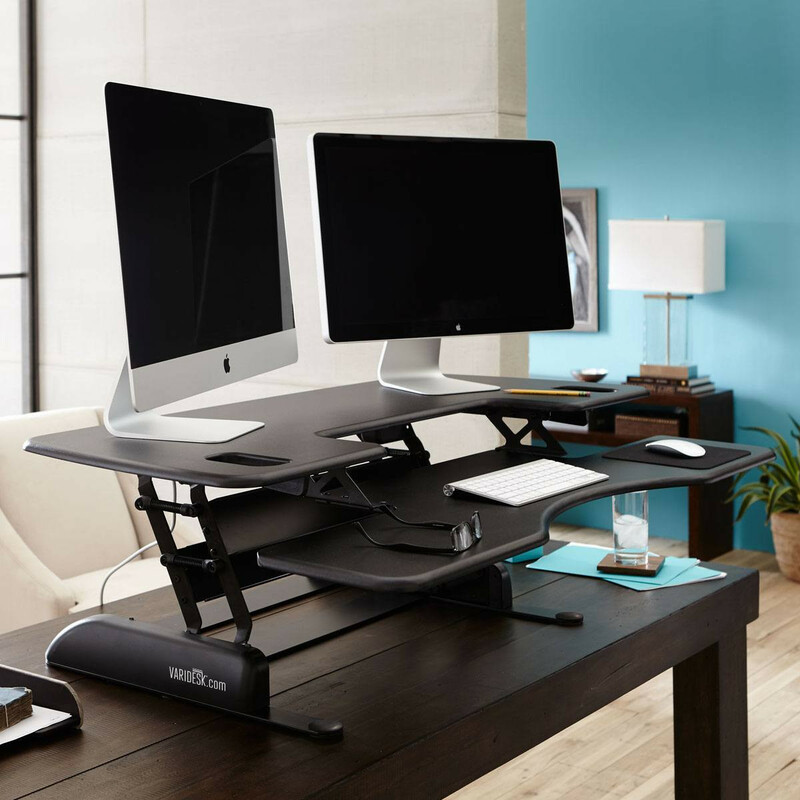 As is the case with most standing desks, using wired computers and accessories can create a bit of a tangled mess that could slightly disrupt overall workflow. Thankfully, this is avoided through the usage of wireless devices. There are also times when the desk can be slightly wobbly and cause the monitors to shake a bit when working vigorously on the keyboard. However, this is a rarity. While the desk is exceedingly ergonomic for the most part, taller users, especially those above 6 ft. 2 in., might find that the device can be slightly trickier to use efficiently, something like an adjustable height desk may work better. Overall, the VARIDESK Pro Plus 48 is a standing desk that is perfect for practically anyone, especially those that work in open offices and are looking to incorporate a more sleek and stylish mechanism into their work area that will boost productivity, while also providing the ability to remain fully healthy, even when working long hours at the office. The ergonomic design makes switching between the sitting and standing positions fluid and effortless, while the large work space means that you have a lot of room to place your accessories and monitors without feeling as though everything’s bunched up on top of the device. The sturdiness of the standing desk is one of its best assets and why wouldn’t it be? Though VARIDESK products often range in quality, the one feature present in all of them is the sturdiness and amazing build quality. The same is true with the Pro 48. The fact that the desk comes fully assembled is also a nice incentive that everyone should appreciate, as attempting to makeshift your own standing desk is a task that is often more time consuming than one might expect. The 11 adjustable heights for the standing desk also help to ensure that nearly everyone will be able to use it to its fullest potential. While it isn’t without its faults, as the size of the standing desk might not fit in all workplaces and an abundance of wires can decrease workflow by a small amount, it’s safe to say that the VARIDESK Pro Plus 48 is one of the very best standing desks on the market and is wholly recommended to anyone looking to stay as healthy as possible while working.